Hint (before starting the coredata part of this tutorial): This tutorial is based on the first two parts, see the first part here and the second part here. You should have them done before starting with this part. Now we are going to add coredata to the project. This way posts and comments will be saved in the coredata database. Additionally, we will add a button to delete the contents of the database and another button to sync the data between the blog and coredata. Click “Next” and choose a name (I chose “wpconnect.xcdatamodeld”). Open the data model you just added to the project. In the bottom right corner you will see two options: “Editor” and “Style”. Open the “Editor” to mode. Use the button “Add Entity” to add two entities, call the first one “Post” and the second one “PostComment”. For the entity “Post”, add an attribute “postId” with the type “Integer 16” and another attribute “title” with the type “String”. Add a relationship called “comments” with the destination “PostComment”. After clicking the relationship “comments”, you will see an relationship inspector on the right side. Set type to “To Many” (because a post has 0..* comments). For the entity “PostComment”, add an attribute “comId” with the type “Integer 16” and another attribute “text” with the type “String”. Add a relationship “post” and set the destination to “Post”. The type needs to stay “To One”, because a comment always belongs to a post. // The directory the application uses to store the Core Data store file. This code uses a directory named "me.meberhard.AnotherText" in the user's Application Support directory. // Performs the save action for the application, which is to send the save: message to the application's managed object context. Any encountered errors are presented to the user. // Returns the NSUndoManager for the application. 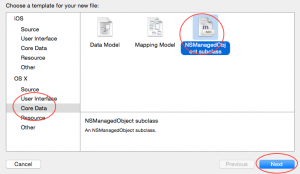 In this case, the manager returned is that of the managed object context for the application. // Save changes in the application's managed object context before the application terminates. // Customize this code block to include application-specific recovery steps. These lines are usually auto-generated when you add an application with coredata. 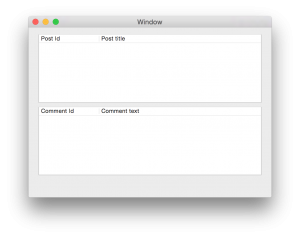 The application has two tables, one displays the posts and the other displays comments on posts. 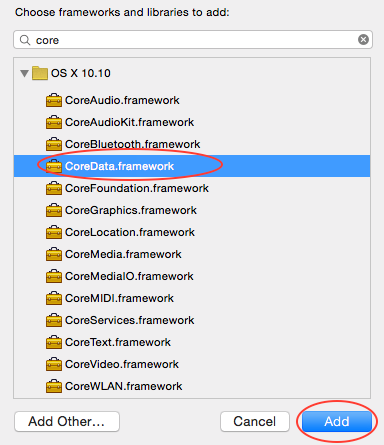 We have two buttons: One for syncing the coredata database with the blog, and another one to wipe the coredata database. When the application start, show all posts which are currently available in the coredata database. When the user clicks syncs, download new posts and comments from the blog (we will not add logic for updating changed posts or for deleting not available posts – in order to keep it simple). When the user deletes the contents of the coredata database, the table views will be empty, because there are no posts and comments available anymore. In applicationDidFinishLaunching we define three observers: The first one should be triggered, if the user clicks on the flushData button in the view, it calls the method “flushData”. The second one is triggered when the user clicks the “sync” button, it calls the method “syncData”. The last observer gets the comments for a certain post, so the ViewController gets the data for the comment table. The call “showPostsInView” starts the application and displays the available posts per method call. The method “receivePostsFromBlog” gets the posts from the defined URL. I iterates over the posts in the JSON answer. For every id of a post it checks, if there is already such an id in the coredata database. If such an id exists, it skips adding of the posts and calls the next method (which checks comments for a post) directly. If not, it adds the posts to the coredata database and consecutively calls the method which checks for comments. “receiveCommentsFromBlogForPost” works the same way as “receivePostsFromBlog”. I receives comments for a certain posts, iterates over the results and adds the comment to the coredata database if it does not already exist. “showPostsInView” queries the coredata database and receives all posts. After, it posts a notification called “showPosts” containing the posts as an object. 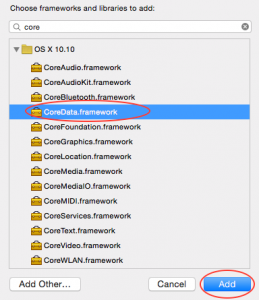 “flushData” and “deleteAllObjectsWithEntityName” are both used to flush the coredata database. One call to “flushData” is sufficient. 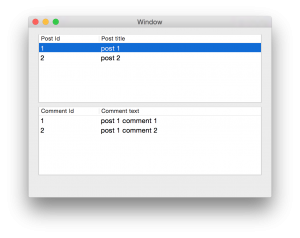 “getCommentsForPostId” queries the coredata database for comments, which are assigned to a post. After, it posts a notification called “showComments”, containing the comments as an object. “checkIfPostIdExists” and “checkIfCommentIdExists” are both helper methods for the first two methods. They check, if a post/comment with a certain ID exists in the coredata database and return NO/YES accordingly. We added “setDelegate” and “setAction” for the two buttons. Furthermore, there are methods which are handling the clicks on these buttons “buttonDeleteDataClick” and “syncButtonClick”. Both post notifications which will trigger the according action. 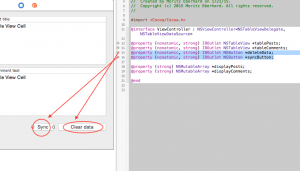 Another change (compared to the previous step of the tutorial) is in the method “viewForTableColumn”. Since we generated the model classes via coredata, postId is not an NSInteger but a NSNUmber. This means, we should access the id via method “[post.postId integerValue]” rather than “post.postId”. 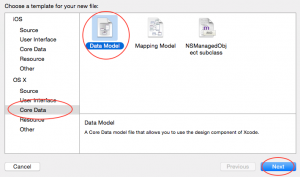 After running the application, you should be able to sync and delete data. If new posts or comments are available on the blog, one click on sync will get that data! From now you could implement further logic to receive more information on posts and comments, or to update changed contents, or to even regard changed contents on update procedures. The whole content is available at GitHub, click here. 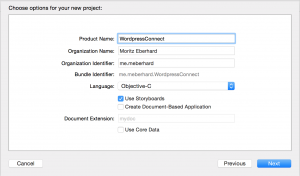 Second step: Connecting the application to a wordpress blog so it used the service. Click here to view the post. 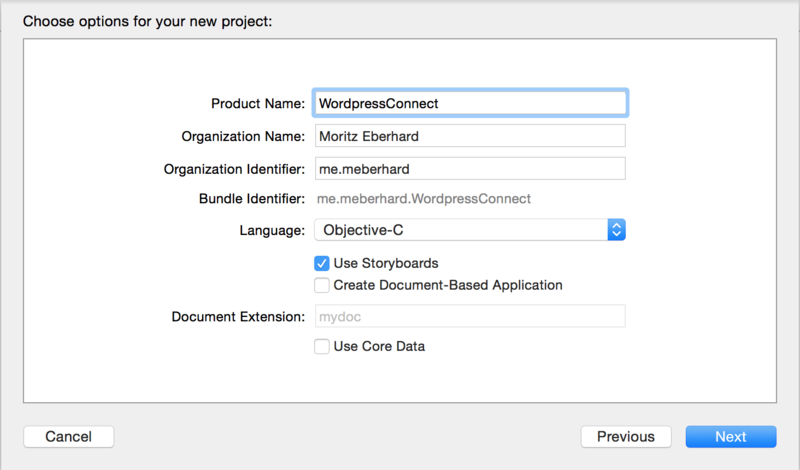 This entry was posted in Uncategorized and tagged coredata, json, objective-c, wordpress, xcode on January 27, 2015 by Moritz Eberhard. 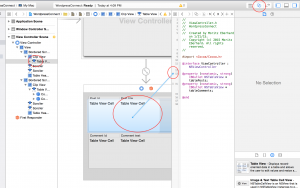 The first part of the objective-c tutorial focuses on the basic creation of the application. 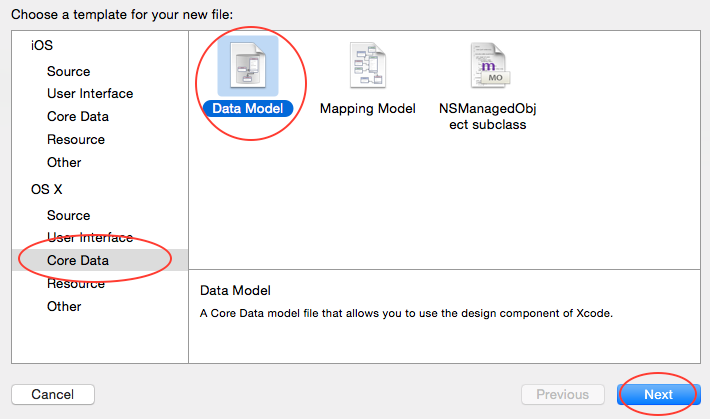 In XCode, add a new project. 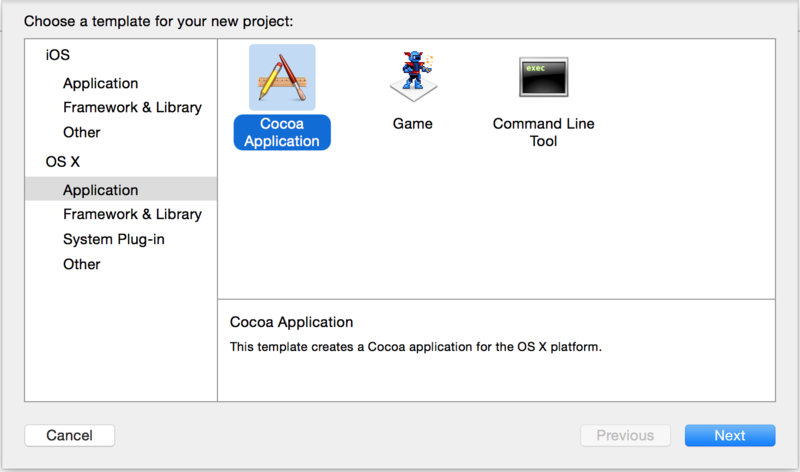 Select “Cocoa Application” under “OS X”. 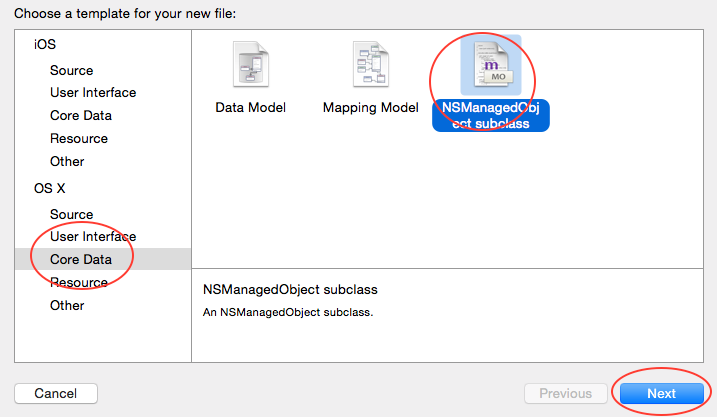 Add a new project in Xcode. The next step requires you to enter a product name. I choose “WordPressConnect”, but the name really does not matter. Everything else can be left like it is. 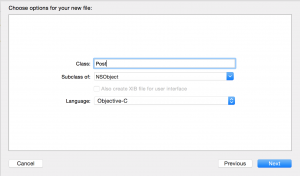 Second step of adding the project in Xcode. The last step requires you to select a folder, where all the sources will be saved. Click “Create” after. 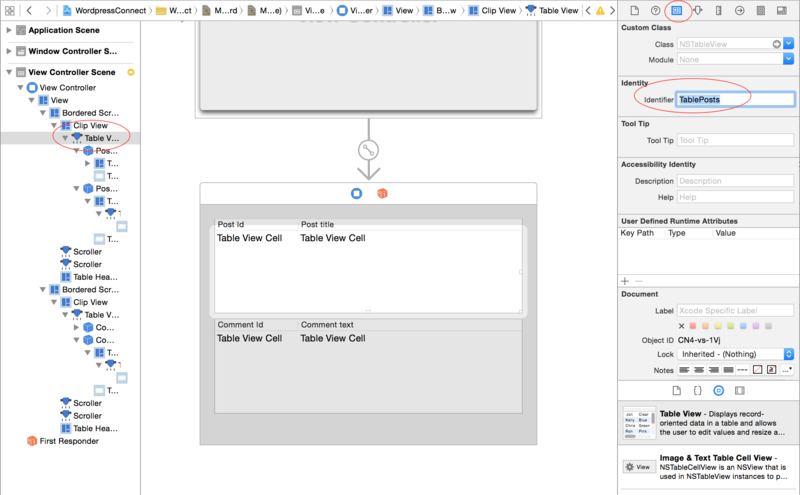 The basic idea is to have two tables in the view (objective-c coding will follow after). The first table shows the id and the title of the post, the second table shows the id and text of a comment. After creating the project, this view can be created using the storyboard. Select the Storyboard from the project files. A view will open which shows the window. 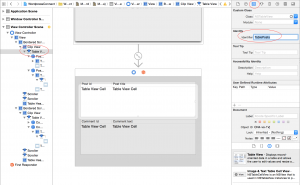 The storyboard in the Xcode project. Search for “table” in the right bottom. All elements, which can be used for creating views are listed here. 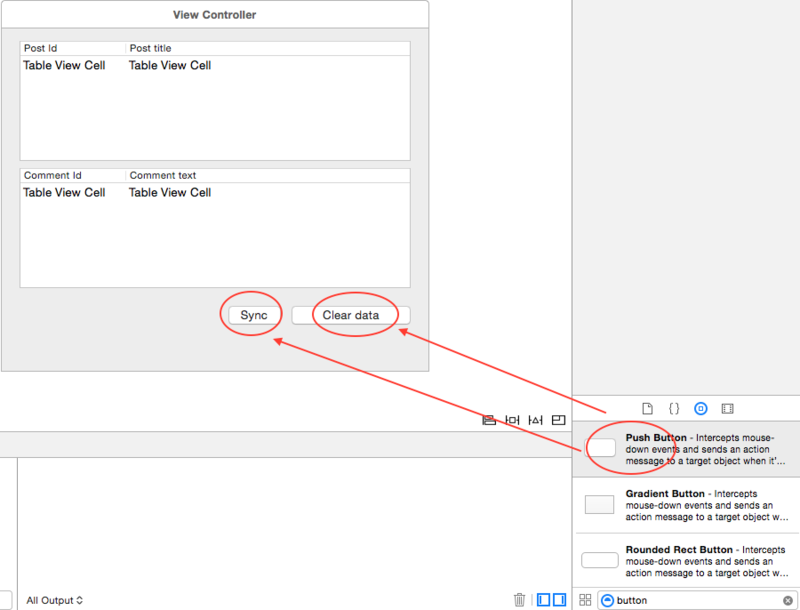 Drag two “Table View” elements to the area which says “View Controller”. After adding the tables, you may double click the table header area to write some headings like “Post Id”, “Post title”, “Comment Id” and “Comment Text”. After doing so, we need to add identifiers, so we know which tables is which. Select a “Table View” (very easy using the tree structure on the left side called “View Controller Scene”), select the first “Table View” and add an identifier using the inspector on the right side (third register). I used “TablePosts” as identifier. Adding table views to the storyboard. For the second table, use “TableComments” as identifier. After that, select the columns and also give them identifiers. I used the following identifiers: “ColumnPostId” and “ColumnPostTile” for the two columns in the first table. “ColumnCommentId” and “ColumnCommentText” for the two columns of the second table. The identifiers give us the possibility, to identify correct tables and columns later in the objective-c implementation. In Xcode you might see two circles next to these properties. We can use them to make the connection between the view and the variables. There is a possibility to show two files next to each other in the IDE (two circles). Click it, choose for the left side the storyboard and for the right side the file ViewController.h. Select in the tree view on the left side of the storyboard the first “Table View”, which represents the tables for the posts. After, click within the circle of the variable “tablePosts” and drag the line onto the table of the storyboard you just selected. 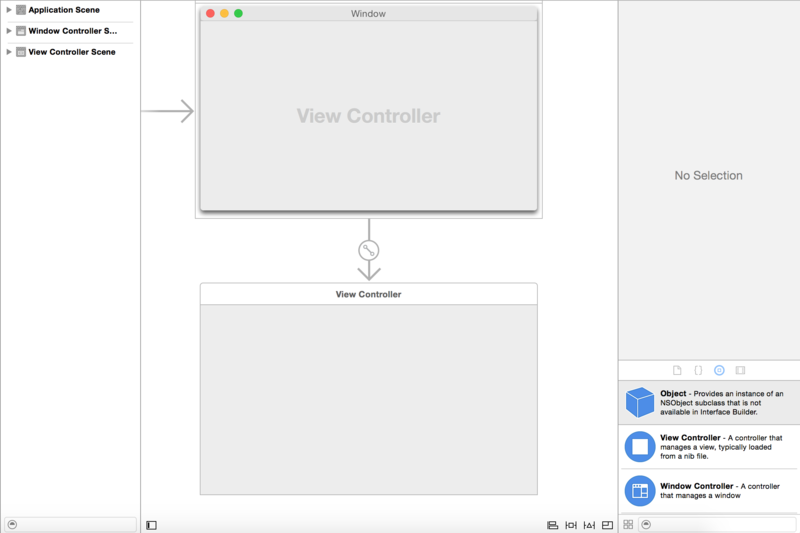 Connect the storyboard with ViewController variables. Sample window after first run. Since we want to deal with posts and comments, we are going to add very simple models for this purpose. The objective-c code will follow. In your project, add a group called “Model”. 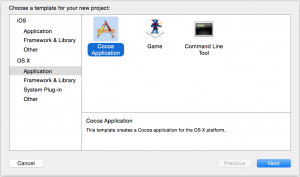 Right-click the folder, select “New File” and choose “Cocoa Class”. 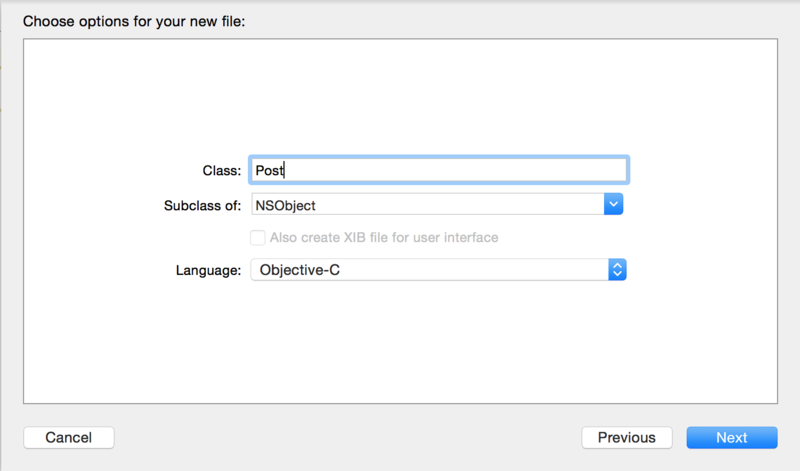 Call the class “Post” and select “NSObject” as “Subclass of”. Add a class for the Posts. Project structure after adding model classes. 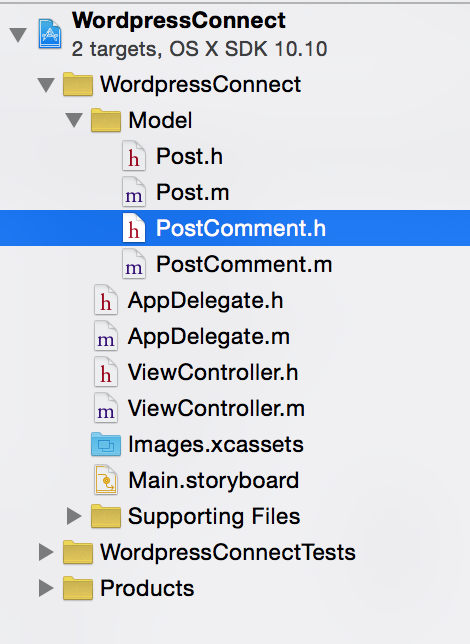 In the header file – AppDelegate.h – we just added two properties in objective-c. They are used to store all posts and comments. 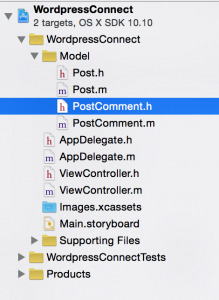 In the implementation file – AppDelegate.m – we add two posts and three comments. After, we output some information of these objects, just to be sure, that everything works fine. 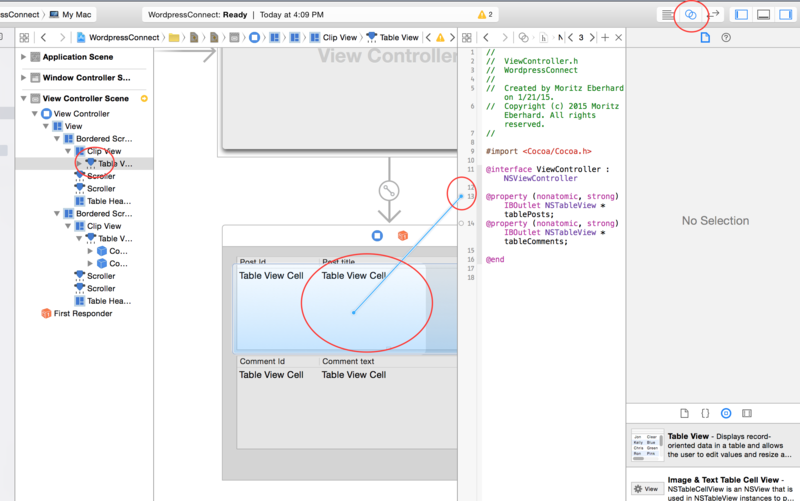 If you run the application like it is, you will see the information in the output window of Xcode. 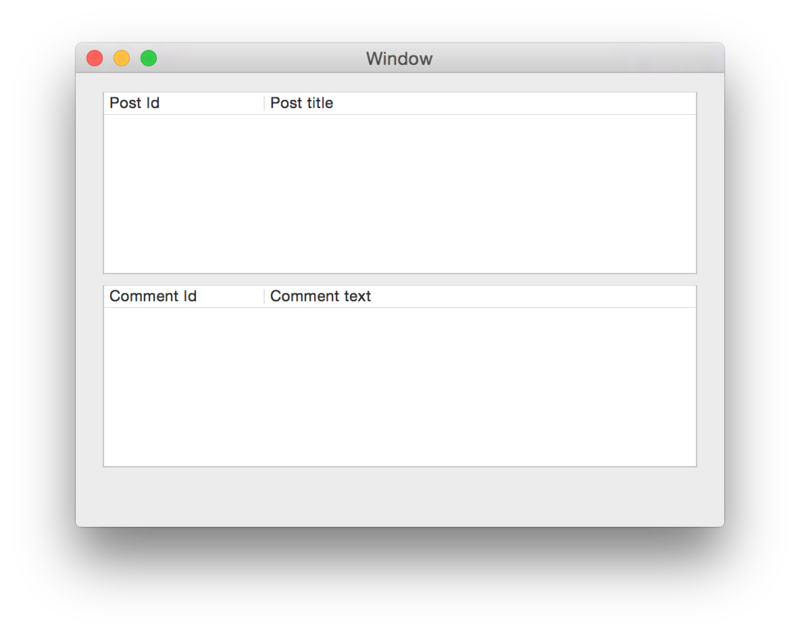 We added two properties: “displayPosts” and “displayComments”. We will use them to store the currently displayed posts and comments. Alright – here we have some more things. The first method “viewDidLoad” sets the delegate and datasource to itself. Like this we define, that the methods of the protocols for the tableviews are implemented in this class. After, there are two observers. They listen to the methods “showPosts” and “showComments”, which we will later send from the implementation of AppDelegate. Short explanation: When we send a notification with the name “showPosts”, it will call the method “setPostsToDisplay”. If we send a notification with the name “ShowComments”, it will call the method “setCommentsToDisplay”. 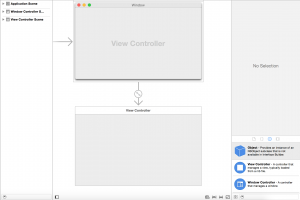 This is an easy way to communicate between AppDelegate and ViewController, without the need to call methods on explicit instances. Ignore the next method “setRepresentedObject”. The two methods after are “setPostsToDisplay” and “setCommentsToDisplay”. 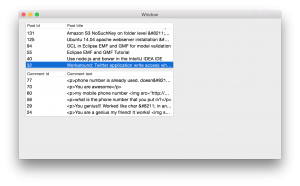 Here we receive the posts or comments from the notification object, set “displayPosts” or “displayComments” and reload accordingly the table view. The method after is called “viewForTableColumn” is the actual implementation of the protocol “NSTableViewDelegate” (click here for the documentation). 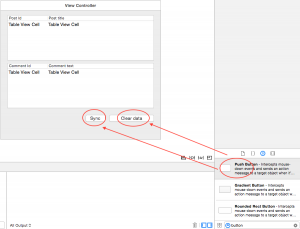 This method returns a cell view (it will be called for every row). We have several if-statements here. We use them in order to find out, which table and column is currently requested. Therefore we use the identifiers, which we declared earlier using the storyboard. “numberOfRowsInTableView” is an implementation of the protocol called “NSTableViewDataSource” (click here for the documentation). It returns the number of rows we want to create in the table. For the first table this would be the amount of posts and for the second table the amount comments. 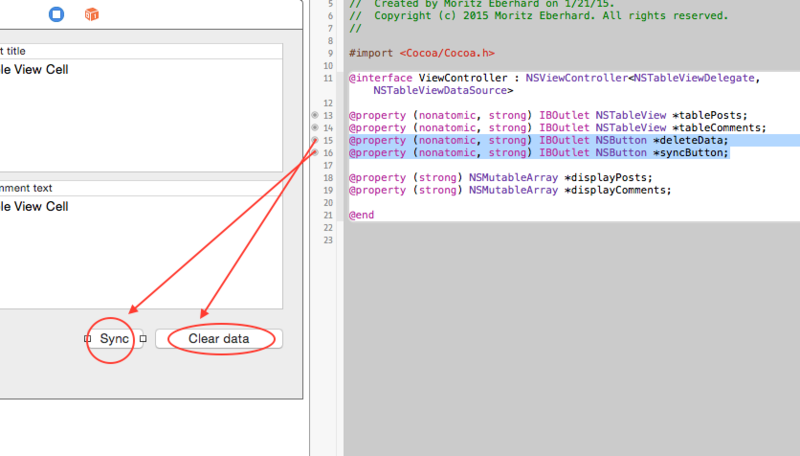 The last method “tableViewSelectionDidChange” is another implementation of “NSTableViewDelegate”. It is called whenever the user selects a row in the table. In our case, we can use it if the user selects a certain post in the first table, to display the comments accordingly in the second table. For this reason, we get the ID of the post which the user selected and send a notification which contains this id. In appDelegate we can look for the comments for this postId and give them back to the ViewController. I deleted the NSLog instructions which were there previously. Instead, we have now to instructions for notifications. The first one sends a notification using the name “showPosts” and as object all posts, because we want to display all posts when the application launches. The second one is an observer, which listens for a notification called “getComments”. This notification will be sent from the ViewController, when the user selects a row. 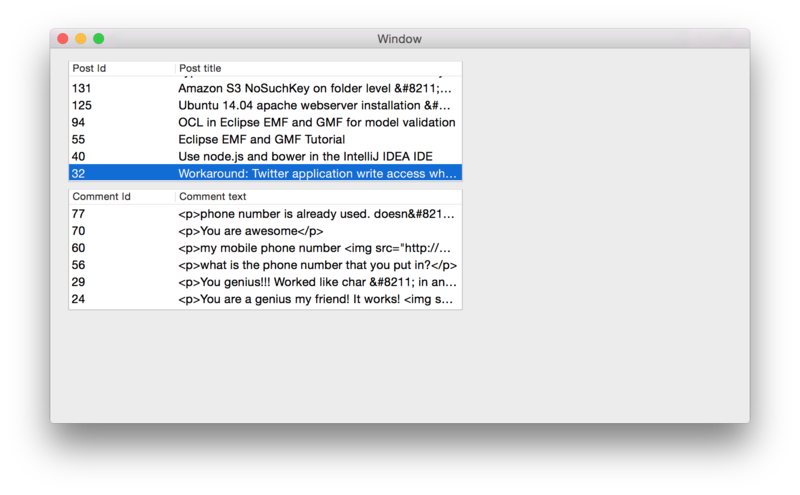 In AppDelegate, this will result in the method “getCommentsForPostId”. This method gets all comments which are assigned to the current postId. It will then send a notification called “showComments” and the selected comments as an object. This notification will cause ViewController to display these comments in the second table. If everything went right you should see the posts and comments after launching the application. This entry was posted in Uncategorized on January 22, 2015 by Moritz Eberhard.